What is a trending card, you ask? Well, a lot of times it seems like a particular card shows up in the readings I do for people more often than others, for a period of time. Do any of you other tarot readers and/or dabblers find some periods of time where a card just seems to show up in 80% of your readings for all sorts of different people? So, I thought it would be a good idea to do a little feature on the “Most Frequently Drawn Card” of the week, since it appears a lot of people might be in need of its message. When people interact with each other on a regular basis, such as a troupe of trapeze artists would, they tend to fall into patterns of interaction with each other. These patterns can be wonderfully constructive and synergistic, when we are interacting with others in ways which fulfill both our needs and increase our skills by playing off of each other. We can enrich each other’s lives by bringing out the best in each other. This card came up for myself when I asked “What should I keep in mind during this gig?” with Anna Brinck and The End of the World, highly skilled musicians who really listen to and respect each other, not to mention have regularly made music together as part of this jazz ensemble or the other for at least the 4 years that I’ve known them (Theresa Reed‘s wonderfully talented son played the drums that night! Smallwaukee 🙂 ). When I sang with them, it felt like being “in the zone”. There was barely any conscious thought to the performance, it just flowed, and the audience was very enthusiastically appreciative. Such a wonderful feeling! Whip raising his voice and escalating the interaction to a fight, responds with “How long was that? […] 17 seconds before my ex-wife asks me if I’ve been drinking!” You can tell that this is the same fight that broke their marriage apart, the fight that they can’t seem to stop having, because of Whip’s repeated pattern of drinking to excess. Breaking negative patterns of interaction can be near impossible sometimes. It requires open communication, empathy and compassion for the other, and a willingness to take a step back and objectively look at our own input into these patterns. Not to mention: are we really objectively perceiving what the other person is trying to convey, or only hearing what our bias allows us to hear? May this be the year we take concrete steps towards breaking our negative patterns of behavior, towards each other, and towards ourselves. Happy 2014! 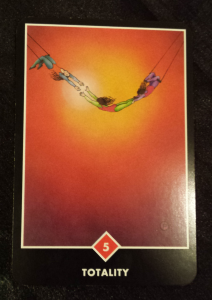 This entry was posted in Readings, Trending Card and tagged in 5 of fire, breaking patterns, music, tarot, trending card.